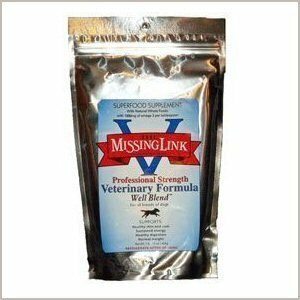 All-in-one Superfood Supplement - The Missing Link Veterinary formula offers double the nutrients to the Missing Link Canine Formula. It also targets the nutritional gap between what nature provides and what's available in commercial foods. The benefits dogs can get from Bully Max is a raise in the immune system (which means your dog will be safer from infections), an raise in metabolism and a raise in vision. Bully Max muscle supplements for dogs are also excellent for proper bone nourishment as well as a raise in tendon strength. This muscle supplement for dogs also aids in their muscle build and a raise in your dogs skin and coat health. Bully Max: provides the following powerful benefits:. Increase Strength, Muscle, Power & Speed. Extend Endurance. Speed Recovery. Better Oxygen Delivery. Stress Fighters. Build Muscle. Raise Health & Immunity. Post Surgery, Chemo, & Trauma. Trans Fat, Sucrose, Corn Syrup Free!. K9 Athletes. Hard Keepers. Dogs Needing to Muscle Up Gorilla Max is a revolutionary dog supplement created by the makers of Bully Max. If you love the benefits your dogs get from Bully Max, you will love Gorilla Max. Gorilla Max is designed for K9 athletes, American Bullies, show dogs, Police dogs, American Pit Bull Terriers, Rottweiler's, Mastiff breeds, German Shepherds, Bulldog Breeds, as well as any other breed of dog that needs added nutrition to build muscle and add size. Gorilla Max is by far the most advanced K9 muscle supplement in the industry. Gorilla Max may be safely used along with Bully Max. Shipping costs are calculated through our website and are based on your location. Shipping is available worldwide. RECOMMENDED DAILY USAGE: For use in dogs over 12 weeks of age. Protein powder Up to 20 lbs. = 6 teaspoons or 1/8 cup Over 20 lbs. = 13 teaspoons or about 1/4 cup (1 Serving) This product is intended for intermittent or supplemental feeding only. This is a natural product. Some variations in color, flavor and aroma may occur from batch to batch. These variations do not affect the quality of the product. 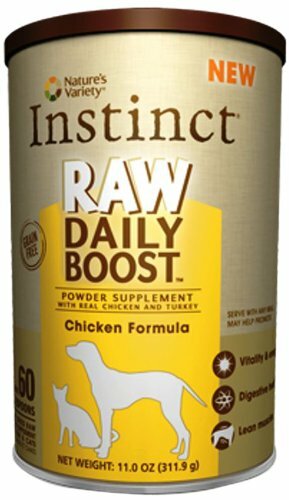 Recommended to store below 80° F.
Instinct Raw Boost Bites and Raw Boost Powder are made by Nature's Variety, a natural pet food company located in Lincoln, Nebraska. Our team is passionate about providing proper, holistic nutrition for your beloved dog and cat. 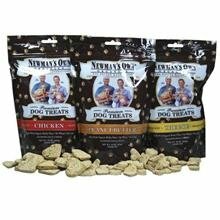 Our freeze-dried raw treats and supplements are simply raw food minus the water. It provides all the benefits and nutrients of raw in a convenient dry form. We are proud pet parents, just like you! So we understand that your pet has a special place in your family, in your life, and in your heart. Our products are sold across the United States and Canada in local and national pet specialty stores. Even when indulging in a treat, pets can enjoy pure, delicious, nutritious raw food. Instinct Raw Boost Bites and Raw Boost Powder provide the nourishment of Instinct Raw in an easy-to-serve, bite-sized snack or powder! Gorilla Max is a muscle building and health supplement for all dogs over the age of 12 weeks. This product is veterinarian designed and approved and meets all FDA and AFFCO standards. This amazing product will help you get the best from your canine and also helps with digestion and protein consumption. Gorilla Max contains revolutionary nutrients and is one of the most talked about dog supplements on the market today Many working class dog breeds use this supplement from law enforcement canine's and shows dogs to champion breed winners. This supplement will add muscle and size to your dog as well as a whole host of health benefits. Bully Max are the makers of high quality dog vitamins, which focus on health and canine muscle building. The company holds high standards for all of their products. 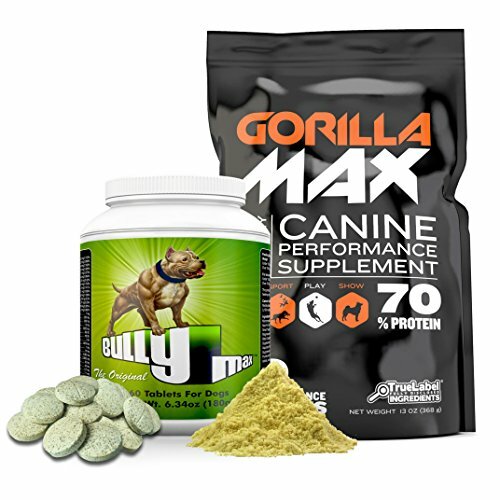 Gorilla Max is the top line supplement from Bully Max. There is 20 grams of protein in every single premium serving. This product can also be used by all dog breeds over the age of 12 weeks. Gorilla Max Most Asked Questions Can Gorilla Max and Bully Max Be Combined For Feeding? Yes, both products can be used with regular feeding of your dog's diet. 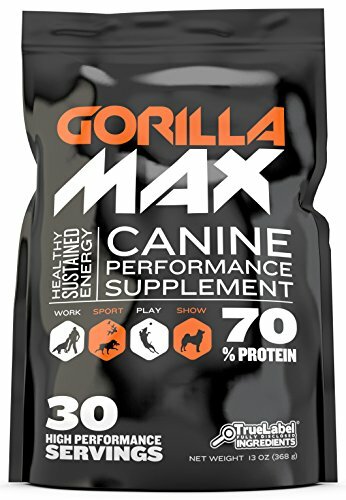 Does Gorilla Max Make Dogs Aggressive or Change Them In Any Way? No, Gorilla Max does not change your dog's behavior. Can Only Pit Bulls Use Gorilla Max? No, Gorilla Max is for use in all dog breeds. Does Gorilla Max Use Any Steroids? No, it contains no steroids or anything harmful to dogs and is all natural. Does It Take Long To See Results? Positive results are seen within your dog in about 2 to 3 weeks' time. Also when the product is stopped the results will not be lost. You will keep seeing good results as long as you use the product. How Do I Give My Dog Gorilla Max? You mix it with your dog's current feeding. For dry food you can add a small fraction of water.